- Get the latest and smartest Portable Float Stereo Bass Speakers Now! PREMIUM HIFI QUALITY: It's made of silicon + aluminum material (3.9" x 3.9" x 1.9 Inches) that is shock resistant and waterproof and can play up to 10 hours when full and the charging time is 3 hours. It has a TF card slot for MP3 player support MP3/WMA/WAV formats. 2 IN 1 CONNECTIVITY: Our mini stereo has a loud speaker performance with Bluetooth connectivity which produce wireless stereo sound quality and allows you to connect to wireless speakers at the same time, with one speaker through smart-phone, and the other as the slave speaker via (TWS) Bluetooth. EASY ACCESS & PORTABLE: With the metal hook you can hang it close to you and enjoy listening music anywhere you go, clip it on your waist, handbag, backpack, hang on walls, tree, hammock, kayak, boat etc. WATERPROOF & SHOCKPROOF: It is 100% IPX7 waterproof and shock proof. You can play music under water. Output is real 5W output it is mega bass hi-fi speaker. When you pair 2pcs of the ST-1 speaker, you will have a total 10W stereo speaker like a 2.0 channel book-self speaker. It can work as a USB speaker, it can be connected to most any standard charger for small electronic devices, input voltage 5V 1.0A. VERSATILE USAGE: Enjoy listening music indoor or outdoor together with your love one, friends or family and let your kids have fun with this floating speaker. Bring it with you at the beach, pool, camping, hiking, fishing, kayaking, boating, bathing, cooking, working, workout, exercise, sleeping/relaxing and more. CLICK the 'ADD TO CART' and BUY this Hifi Stereo Speaker Black before this LIMITED TIME OFFER expires. ✓ LIGHTWEIGHT WIRELESS BLUETOOTH SPEAKER - Top quality aluminum and silicone Bluetooth speaker with multiple buttons for easy control such as; play, pause, next song, up & down volume, skip etc. It's just 3.9" x 3.9" x 1.9 Inches and weighs just 200 grams. ✓ HIGH-QUALITY SOUND AND MEGA BASS - Are you tired of speakers that makes your favorite music bad because of the low-quality speakers? This Bluetooth speaker has a POWERFUL crystal clear sound system with EXTRA GOOD BASE SOUND. Perfect for beach, travel, camping, festival, gym or any other activity you may like with amazing PLAYING TIME UP TO 10 HOURS. ✓ QUICK BLUETOOTH 4.2 CONNECT & PERFECT GIFT - This speaker is easy to pair and connects quickly with almost any Bluetooth compatible device such as; android smartphone, iPhone, iPad, computer, PC, MacBook etc. This amazing speaker would be a GREAT GIFT for anyone close to you on birthdays, Christmas, graduation, housewarming and much more. ✓ TF card slot for MP3 player support MP3/WMA/WAV formats. Our mini stereo has a loud speaker performance with Bluetooth connectivity which produce wireless stereo sound quality and allows you to connect to wireless speakers at the same time, with one speaker through smart-phone, and the other as the slave speaker via (TWS) Bluetooth. You can simply charge the speaker via a Micro USB cable, input voltage 5V DC 0.5-1.0A, can be connected to most any standard charger for small electronic devices. 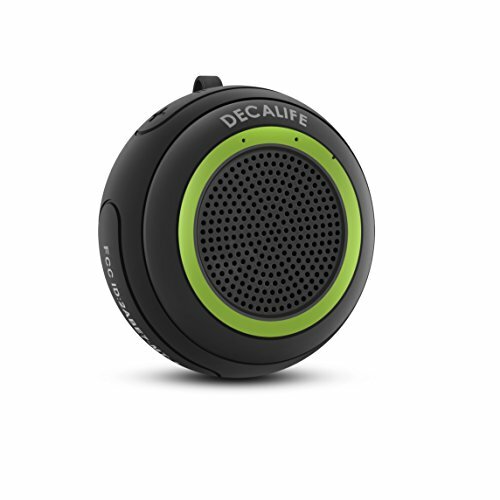 If you have any questions about this product by DECALIFE, contact us by completing and submitting the form below. If you are looking for a specif part number, please include it with your message.